I have always loved the idea of taking interesting events from Australia’s maritime history and shaping them into poems or song lyrics for contemporary audiences. Stan Rogers, the Canadian singer songwriter, is the master of this, with songs such as ‘The Mary Ellen Carter’ and ‘Barrett’s Privateers’. I can’t really think of an Australian equivalent. We have plenty of songs about shearers and drovers, but we have never mythologised our maritime history, rich as it is. Since becoming friends with Maggie Somerville and staying at her house in Foster, I have begun to reacquaint myself with the history of South Gippsland, much of which is, of course, maritime. 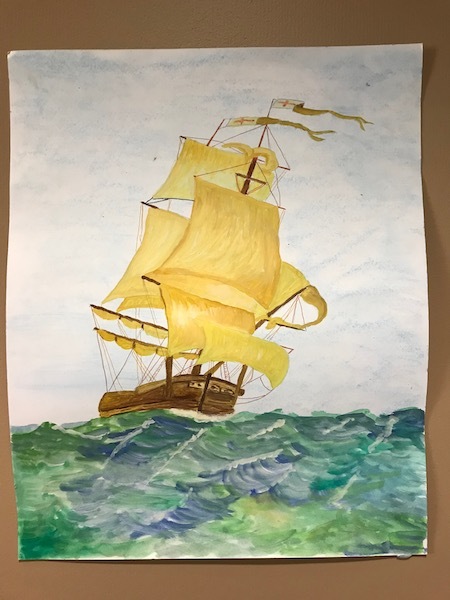 It is tempting to simply write about shipwrecks, but that seems such a cheap way of approaching the subject – of course they are going to be tragic, and there is no shortage of them to choose from. 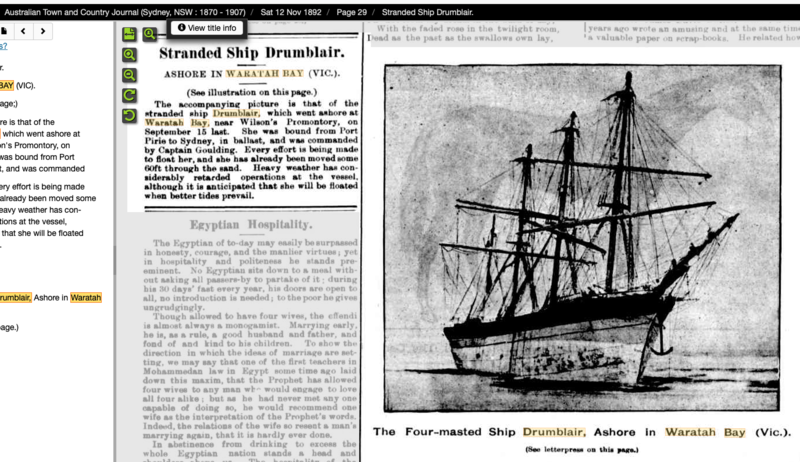 The first article, published in Sydney in the Australian Town and Country Journal on Saturday 12 November 1892, tells us that the four masted ship ‘Drumblair’ has become stranded on the sand in Waratah Bay on the way from Sydney to Port Pirie in South Australia. 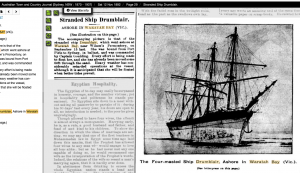 The second article, published in Melbourne in The Argus on Friday 23 December 1892, tells us that the Drumblair was winched off the sand with the help of anchors that were left behind, and are obviously very valuable. 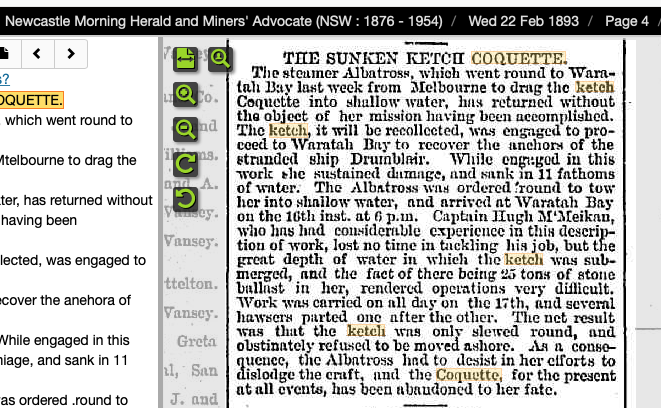 The ketch ‘Coquette’ has been sent from Melbourne to retrieve the anchors and related gear (presumably pulleys and ropes/cables). An anchor is successfully winched out of the sea but, unfortunately, it smashes against the bow of the ‘Coquette’, and causes sufficient damage to the hull that the ‘Coquette’ sinks within ten minutes, in about eight fathoms (48 feet) of water. 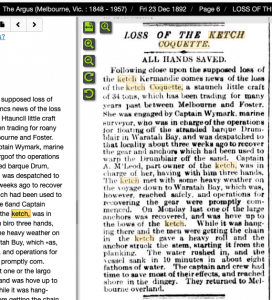 The crew take to a dinghy, arrive safely on shore, and return to Melbourne overland. What was her fate? Was the ‘Coquette’ ever raised from the sea floor? Did she simply disintegrate on the seabed? Do traces of her remain? I have been unable to answer any of these questions. Meanwhile, here is the song lyric I pieced together from these three articles. It’s sunk beneath Waratah Bay. We can lift her with ropes. Alas it will not be today. From where it lay so helpless on the sand. Beneath her bow went all awry. It struck her stem, and wrenched it from its planks. The ocean quickly rushed right in. 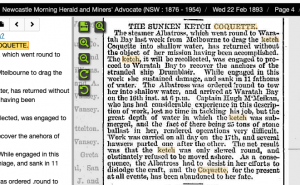 She sank, but none were drowned – a cause for thanks. To raise the ketch ‘Coquette’ from where it sat. And that it seems, at least for now, is that. I am sure Stan Rogers could have created something far more entertaining and engaging, but I guess it is still better than nothing! 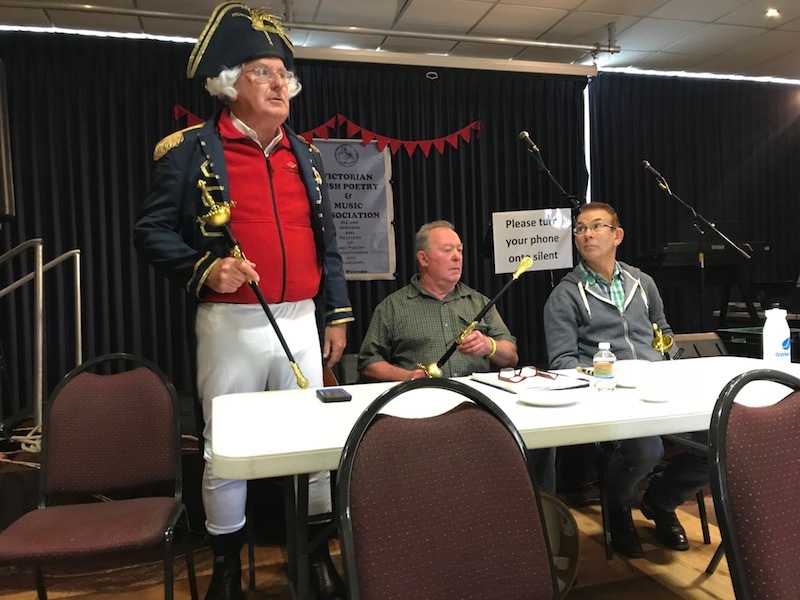 Maggie and I visited the Benalla Entertainment Muster last Sunday. 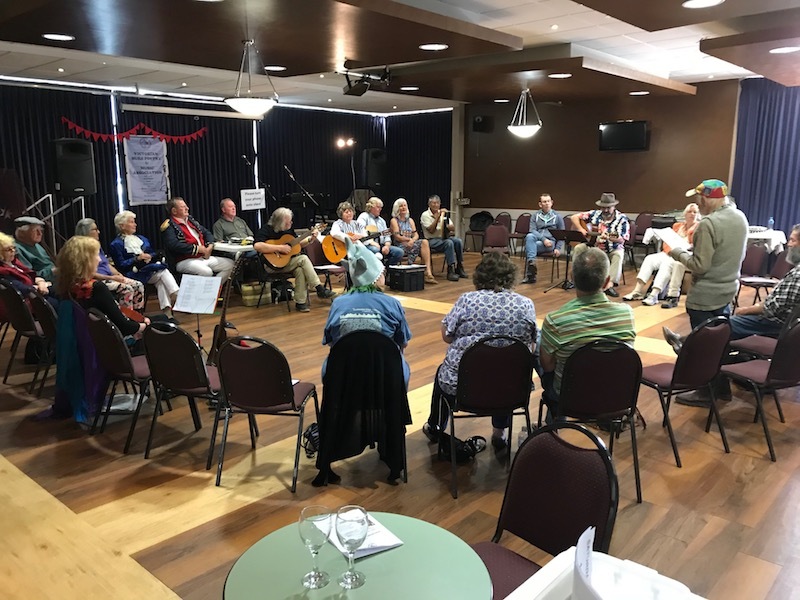 This is an annual event run by the Victorian Bush Poetry and Music Association, and organised primarily by Cudgewa-based Jan Lewis. It is a great fun weekend, and I have been attending it for a number of years now. It is also a good opportunity to promote the Toolangi C. J. Dennis Poetry Festival, which usually follows a week or two later. (This year it is following a week later – taking place this coming weekend.) 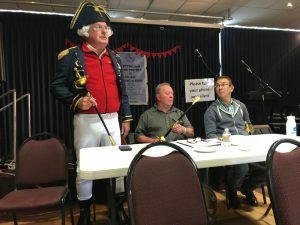 Some years I have attended on both the Saturday and the Sunday, staying overnight in Benalla, and Maggie has joined me for the two days a couple of times in recent years, but my current work commitments make it difficult for me to get there on the Saturday. As always, it was great fun. 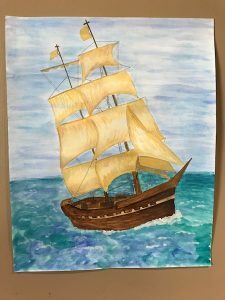 This year, a ‘sea shanty’ theme was chosen, which lent itself to being interpreted in a number of ways. Certainly the most visually spectacular of these was the court martial of Captain Kirley by Admiral Carrington and Co.
Val Kirley’s paintings of sailing ships added to the nautical atmosphere. Maggie (back) joins Jan Lewis (left) and Christine Boult (right) in song. Maurie Foun (lagerphone), Jim Carlisle and Jeff Mifsud (guitar) make music together. 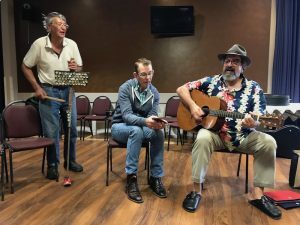 Well, the launch of “‘The Billy Died With Its Boots On’ and Other Australian Verse” was held on Sunday, and I’ve had time to come down to earth and reflect upon it all. Without doubt, it was a great success. Walker Books, the publisher, and Readings bookshop, the venue, had done a great job to together put on a fine display. It was absolutely magical to see multiple copies of the book – a wall of “Billys” – in a grand crescent at the back counter. I was thrilled that so many people turned up to support me. Members of my family were there (of course), old friends, new friends, friends from sailing, skiing and bushwalking, friends from work, children’s writers, bush poets and reciters, and others. Geoffrey Graham did a fine job launching the book and acting as master of ceremonies, as I knew he would. He also said some very kind things about me, for which I am truly grateful. Edel Wignell had been inspired to write a poem about the book, which she read. Edel has been a tremendous support to me in recent years, and it was wonderful to have her contributing to the launch in this way. 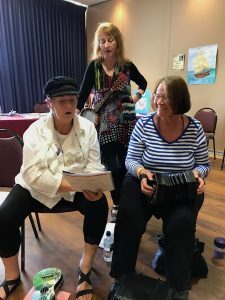 Another friend, songwriter and musician Maggie Somerville, had been inspired to write a melody to accompany “The Sash” (the poem that tells the story of Ned Kelly’s rescue of the drowning Richard Shelton from Hughes Creek in Avenel) which she sang to round off proceedings, accompanied by yet another friend, Marie Butler, on accordion. It was a wonderful way to finish the afternoon. What was particularly gratifying, of course, was the number of people who wished to buy a copy of the book afterwards. No, I didn’t develop writer’s cramp but, yet, I was certainly at risk of doing so! Thank you again to everybody involved in making the afternoon such a memorable success. This book really is the distillation of a lifetime of writing. There were many times when I doubted if it would ever happen. Dreams do come true! Last night I returned from a fabulous holiday sailing and camping in the Gippsland Lakes with my son, Thomas, and two of his mates, Alex and Daniel. We established a base camp at Emu Bight in The Lakes National Park, east of Lochsport, on Sperm Whale Head. The day got off to a wonderful start. It was hot and still, and a pod – perhaps eight – of the local dolphins swam past the calm waters of Emu Bight. 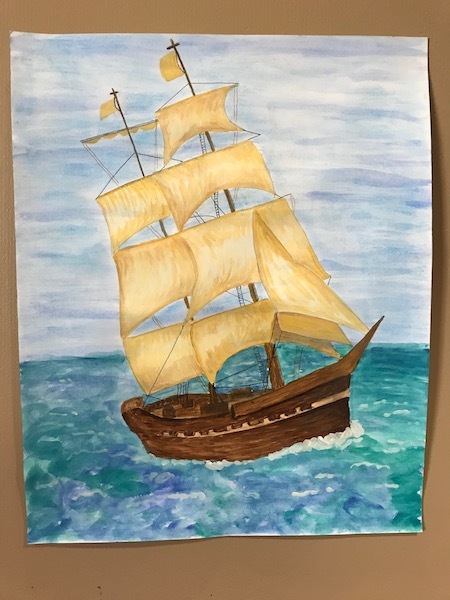 They were a fair way off – perhaps a couple of hundred yards – yet because of the quietness of the bay, and no doubt due in some way to how sound travels over water – we could hear their blows as they surfaced. Then they put on a stunning aerial display for us, leaping repeatedly out of the water. It was utter magic. Eventually they moved on, and we got down to the serious business of rigging and packing the boat, and setting sail. We set off with a light breeze, which soon dropped, leaving us becalmed in the middle of Lake Victoria. It didn’t take long for the gang to realise this was a golden opportunity for a swim. Eventually Thomas returned to the boat, and I decided to have a dip myself. There is nothing like having a whole lake to yourself – especially when it is about 10km long! Eventually the wind picked up a little, and we continued on our travels. The only real navigational decision to make was whether to go the long way around Raymond Island, or take the short cut through the very narrow McMillan Strait that separates the island from Paynesville. There was no particularly strong argument one way or another, so I made the executive the decision that we would take the long way round. I think I just liked the idea of sailing in open water. It was indeed a long way, but eventually we rounded Point King, at the north of Raymond Island, and could just sight the silt jetties on the horizon. As we approached them, we heard thunder and saw rain clouds behind them. It was a little unnerving, and we briefly toyed with the idea of heading west to the mainland. The situation seemed to improve a little, though, so we plugged on when, suddenly (“out of the blue”, so to speak), we were hit by a massive northwester that we really didn’t see coming. It was one of the strongest winds I have ever sailed in. There was no way we could beat into it. The best I could manage was a broad reach, with all four of us hiking out hard. We were literally being driven before the gale! I quickly realised we had no hope of making the silt jetties, and would eventually have to make a landfall in Tambo Bay, to the east. Unfortunately, this was not close, which meant a long and nail-biting ride trying to make sure the mast kept pointing towards the sky as we rode the tempest. The next cheerful little discovery was that most of the coast seemed to be lined with rocks, but eventually I spotted a small stretch of sand, and made for that. Finally, with a huge sense of relief, we made landfall. Tambo Bay, just to the south of the mouth of the Tambo River, is a particularly cheerless stretch of coastline. It has a very wild, abandoned, unloved feel to it. It looks like a dumping ground of sorts, as though we are by no means the first to have been washed up on its shores. It also looks very flood prone, and as though it might have once been cleared for farming, but ultimately abandoned. We couldn’t resist this opportunity for a shot of the boys watching ‘local tele’ (Thomas left, Alex middle, Daniel right). We had a bite to eat while the wind died down, and then decided to make the final push for the silt jetties. We reached them without great difficulty, but they turned out to be a huge disappointment. The main problem was that rocks had been placed all around their shores to stabilise them. This made it very difficult to find a place to launch our boat. Eventually I found a muddy bank inside the mouth of the Mitchell River itself, but by this time the boys had decided the whole area looked thoroughly uninviting. We eventually resolved, therefore, to try to make a dash for Duck Arm before daylight failed us. We had spent a lovely day beside this beautiful patch of water at the end of the Banksia Peninsula in Lake Victoria the previous year, and it seemed to make perfect sense to spend the night there again. But did we have time? Duck Arm is south west of Paynesville and Raymond Island, so the island needed to be negotiated once more. This time, however, there was no real option other than facing the shorter route through McMillan Strait. Unfortunately, we reached it to find the wind was pretty much on the nose, so we would have to tack all the way up it. It was hard work in a brisk breeze and narrow water, but we very nearly made it. Alas, however, another huge gust of wind towards the end forced us to make for shore once more. This time, the shore was very close but again, it was mostly rocks. Once more, I spotted a patch of sand, and we made another safe landfall. As you can see, the environment was essentially suburban, with no obvious camping options on offer. Fortunately, a very kind local gentleman gave us permission to camp on the nature strip beside his back gate. Here we are, tucked in cosily out of the wind. The wind continued to rage throughout the night, and we wondered if we would have to spend the next day holed up on Raymond Island. Fortunately the next morning, though cold and grey, brought a much more gentle breeze, and we woke early, packed and headed off as soon as possible, before the wind had a chance to build once more. Here we are packing once more. We passed through the remainder of McMillan Strait without incident, then struck out across Lake Victoria to the passage of water that runs between Banksia Peninsula and Sperm Whale Head. Once through here we were becalmed once more for an hour or so – which allowed for another swim in the lake – before at last returning to Emu Bight at about midday. 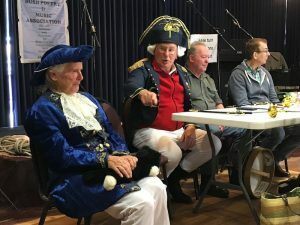 It had been a fabulous twenty four hours – dolphins, swimming in calm waters, running before gales, and simply enjoying sailing the lovely waterways of the Gippsland Lakes. Next year, though, we might make life a bit easier, and simply head for Duck Arm in the first place!